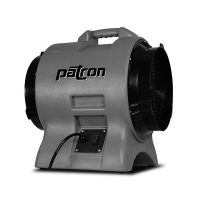 The FA-12 is lightweight, durable, and best suited for industrial applications where maximum airflow is crucial. The shell is corrosion, chemical, and UV resistant and features a built-in carrying handle. With a stackable design the fans can be operated or stored in confined spaces. Pushing 2300 CFM of free air flow, the fan can be ducted up to 125-ft with straight ducting. An integrated on/off switch makes operation simple.